There’s a very traditional Sao Paulo City Tour and that includes Downtown Sao Paulo. A good map in hands is crucial and after doing a good web search I came across a very complete one. See the map here. All the sightseeing above can be done by walking, starting, for example, from Catedral da Sé. From here I do prefer continue on walking and go to 25 de Março street, but it can be tiring for some people and subway can be an option. Or from Patio do Colégio, you can go to 25 de Março and then continue te tour to the other touristic points I suggested. I simply saved 25 de Março for later, because Mercado Municipal is near by and I’d rather have lunch there, after an interesting walk on 25 de Março. Walking from Viaduto do Chá (see map) you should take Boa Vista Street and then Ladeira Porto Geral to reach 25 de Marco. On the Boa Vista St, there is a nice coffee place – Café Girondino (Rua Boa Vista, 365). If you don’t want to eat at Mercadão, this place can be a good alternative. If you’re a tireless person as I am, you can continue on your tour and go to Estação da Luz and end your day at Pinacoteca Museum. For that, you should go back to Ladeira Porto Geral and take the subway to Luz Station (estação da Luz). 11. Estacão da Luz e Julio Prestes – an active train station, built in the end of the XIX century. Nice old construction, well-preserved (#16 on the Map). There is a park in the area, Parque da Luz, open to public visit. 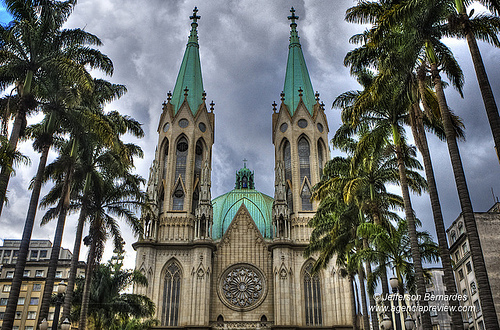 There are more posts on “Visiting Sao Paulo” to come in the near future!